This month we have some exciting news to share from each of our African partners, although sadly there is also some news that reminds us of how dangerous life is there for them. As I think of how often I write similar phrases, I am reminded that we are here on EARTH right now and even when we pass through seasons of blessing and joy, we should remember that we aren’t in Heaven YET! Certainly we should embrace and fully enjoy the good times, yet not be surprised or unprepared for when a new season of challenges, disappointment or even disaster hits. If we are honest, we all pass through times when we feel especially down and even hopeless, or overwhelmed by stressful situations and anxiety. At our local church here in Maryland, our pastor (Todd Crofford) is presently teaching a 6-week series called “Meltdown”. It is a really frank but encouraging look at how we can better handle our emotions and stay mentally healthy as we navigate our way through this unpredictable life on earth – and learn how to have the peace that God offers us in such difficult times. I have been really blessed by it myself so far and believe it could be of great help and blessing to both family and friends, so want to share the link to view the sermons online. http://reallife.us/content.cfm?id=213&series=129 Praise God for all the ways that we can encourage one another in the Body of Christ today, no matter where we live around the world! Be blessed, Shirley and Gerald. Pastor Honoré in C.A.R. 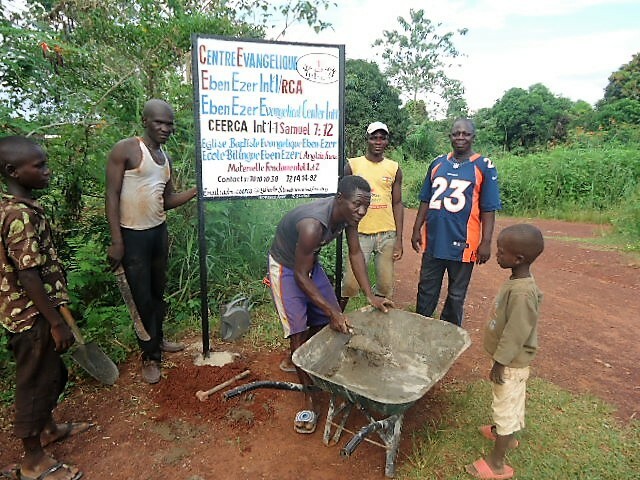 sent us some great photos along with the exciting news that they have started a school at the CEERCA ministry site! This comes after a very successful children’s ministry training seminar and VBS, and so is a wonderful step forward to minister to the local children in addition to the church. 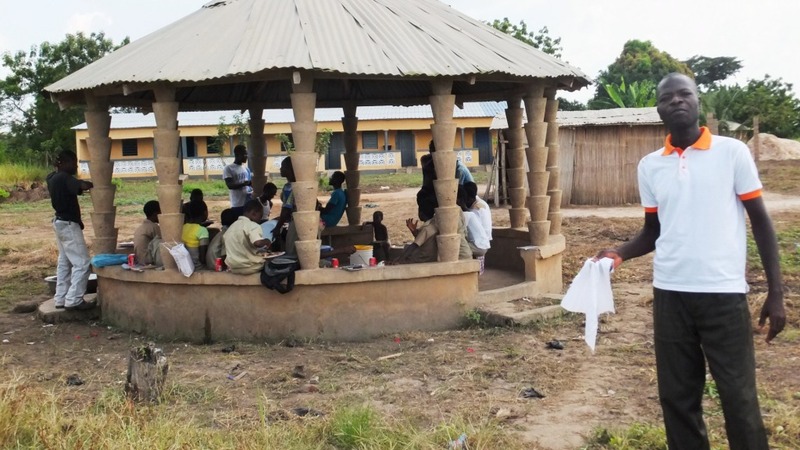 It is primarily for the younger children, orphans and others who cannot attend the regular government schools. 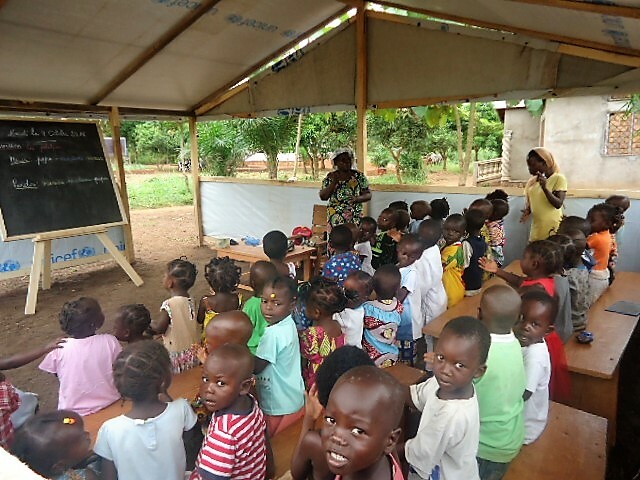 As can be seen in these photos, the teaching includes basic French and English, and already is being joyfully received by some 200 children! The third photo shows the inauguration ceremony (today Oct 15th) as the school is officially recognized by the government. When possible a meal is also shared with them. You may recall that they have been working on the church construction for years now and still do not have permanent walls or roof, but this in no way stops them from continuing with the REAL work of the church! In addition, Clarisse continues the all-important work of translating the Bible into the local language. So far we have been unable to send regular financial support for this wonderful ministry, but if you would like to send a special donation for this work, just enclose a note to that effect and we will pass on 100% of it to them. Mike in Kenya is pictured here with some of the teens at his local church where he is in charge of the youth and children’s ministries. 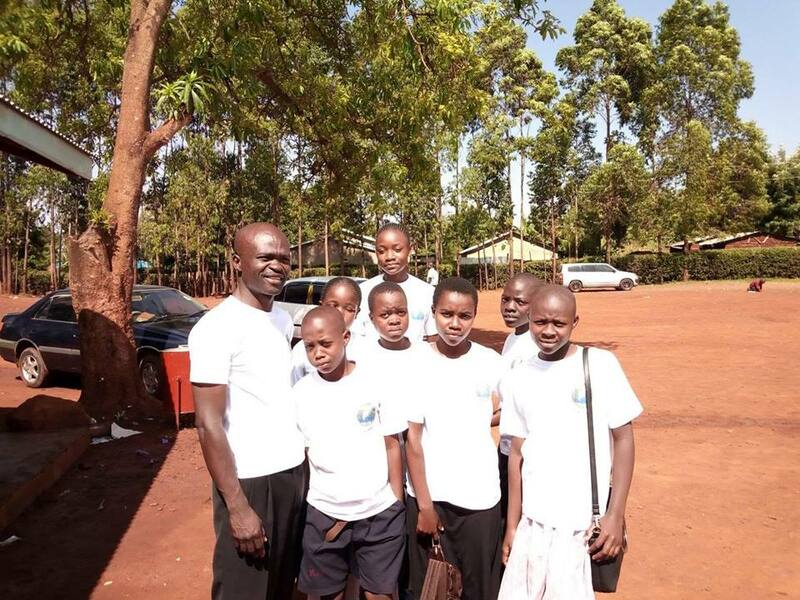 School started again in Kenya at the end of September, so he’s back to being very busy with evangelizing in schools and organizing more student-led bible study groups. 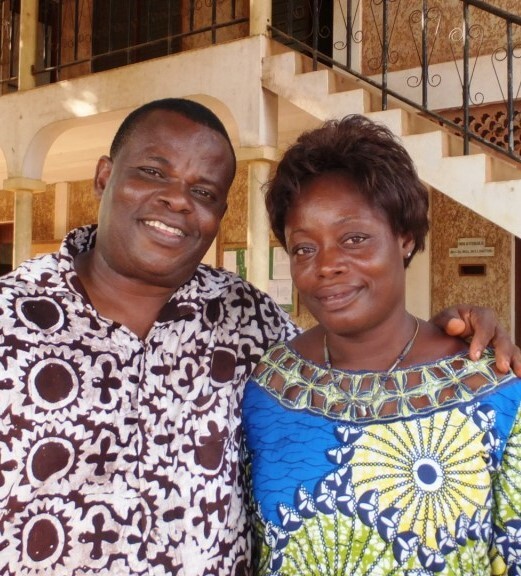 He recently returned to Mumias where he helped with a large children’s ministry conference this past August. The children’s ministry there is going really great with a big team – you can see videos of the kids enthusiastically worshipping God on his Facebook page. He just shared some very exciting news – that he has been invited to go to the UK in January 2019 to speak at an international children’s ministry conference! We pray that God will clearly guide him as he begins to prepare for this amazing ministry trip! 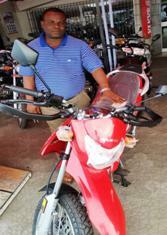 Pastor Sika in Togo sent us a great praise report a few weeks ago along with this photo of a new motorcycle that he was able to buy for use in the ministry (a long awaited answer to prayer!). He wrote: “The field ministry requires efficient means of transportation since there are villages which cannot be reached otherwise. We are grateful to the Lord for the salvation of souls despite the chaotic situation of our country. We are grateful for the health and the care offered by God for all of my family and for all the board.” Little did he know how they would soon need that care and protection from God! We just learned that a week ago, at about 1 a.m. on the Sunday night, his wife Lucie went down to bring in the family’s clothes from the line in their backyard. She was suddenly attacked by a group of heavily-armed thieves who had broken in to rob the house. Thankfully her cries were heard by Pastor Sika and his teenage boys and the thieves ran off before causing more harm. But we can all relate to the horrific feelings of being violated inside one’s own home! 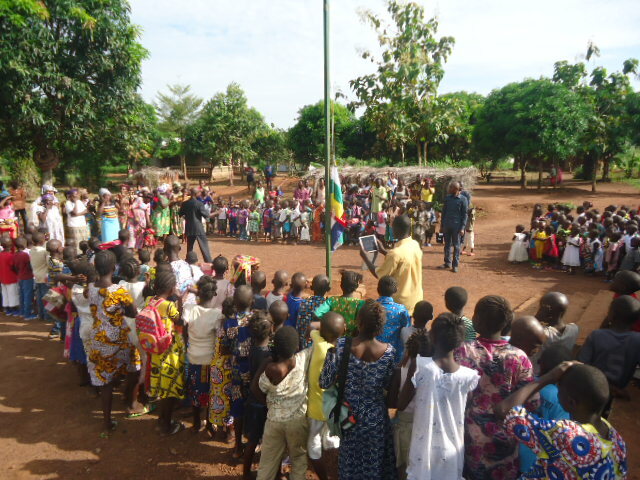 Pastor Sika reports that, in Togo too, the new school year has started and he is busy teaching bible courses in schools again. He also recently organized a special training session for about a hundred pastors in the Lomé area. He sent these photos of his recent visit to the Joseph Project orphanage in Sika-Kondji, and gives praise to God for the good harvest this year which yielded a lot of corn and yams, in addition to cassava. These are all very important staples in the diet there. 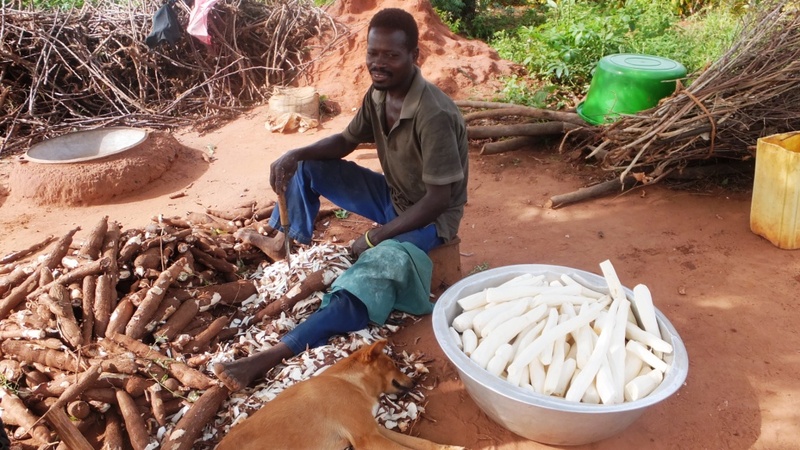 The peeled cassava can be eaten raw, or boiled and eaten with palm oil. In addition it can be ground into a flour that is added to peanuts, sugar, rice or beans. 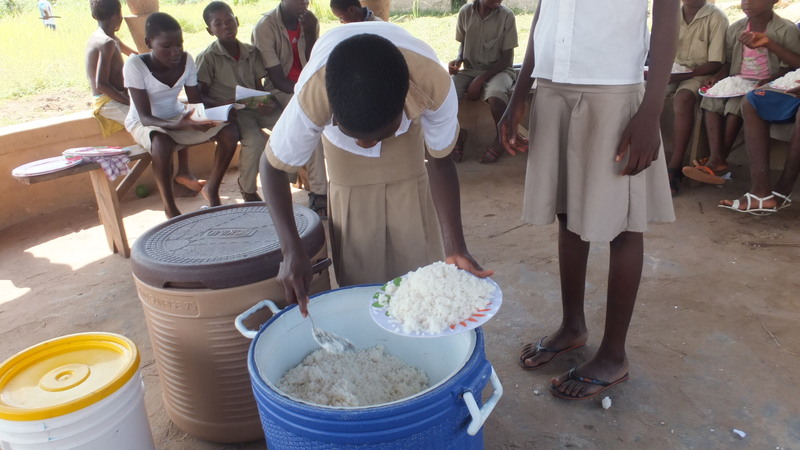 All this makes a lot of work, but greatly helps provide basic food for the orphans – although it is somewhat seasonal and other foods such as fish and meat are needed to provide complete nutrition. Most of the orphans are now teenagers so they have very healthy appetites! In this final picture, the children can be seen eating. The man in the foreground is a new volunteer who is helping regularly at the orphanage. It is hoped that if he proves faithful, he can be added to the staff. With rising prices due to the instability of the country, the monthly needs (totaling about $1,000) are sadly not always met, but there’s no doubt that without the agricultural project at the JP the situation would be far worse! Thank you all for your faithful support that provides not only a home for the orphans, but also a family, education, and training that is both spiritual and also practical through the farming experiences.